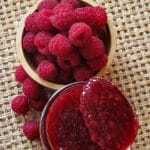 This easy Low Sugar Raspberry Jam recipe is bursting with raspberry flavor. It uses less sugar and can be made with fresh or frozen raspberries. Prepare raspberries by cleaning (if needed) and gently cooking in a heavy bottom pot. I use my 8 quart stock pot. Once softened, run through a food mill or strainer to remove some of the seeds if you like (once for fewer seeds, twice for more seeds) or simply mash berries. Measure out 4 cups of berry puree and return puree to pot. Sterilize six 8-ounce canning jars, keep hot. Prepare lids and rings. Add calcium water to raspberry puree. Bring to a full boil. Add sugar-pectin (or honey-pectin) mixture, stir vigorously 1-2 minutes while cooking to dissolve pectin. Wipe rims clean and screw on the lids. Process for 10 minutes in water bath canner (add 1 minute for every 1,000 feet above sea level). Jam will last about three weeks once opened. Makes around 4-5 cups. Eat any leftover puree, or use to top ice cream or stir into yogurt.